Stephan Würth has taken his ardent personal love of the sport and transformed it into Tennis Fan, a collection of black and white photographs that he took on Kodak film over the past ten years. Comprised of gelatin silver prints on beautiful Czech paper, the book captures Stephan’s life as a tennis fan, traveling to tournaments, practicing on new courts, and being captivated by everything tennis. Traveling from Brazil to Italy to Belize, among the likes of Rafael Nadal and Roger Federer, Würth created a unique, spirited selection of images. A follow-up to his other celebrated titles with Damiani, Ghost Town(2011) and Ikinga (2016), Tennis Fanis a playful addition to his oeuvre, as captivating and personal as the game itself can get. Ghost Town is the result of Stephan's lifelong fascination with the American West. Since moving to the United States from his native Germany, he has been fascinated with the subliminal landscape of the American West and the isolation and freedom of infinite desert horizons. 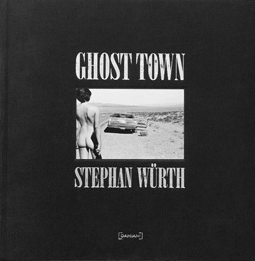 Würth captures this geographical romance with the series Ghost Town. These photographs narrate a dream of three women as they journey through Nevada, where they soon find themselves stranded with a broken-down car on the side of a desolate road. What happens next is the story that unfolds in Ghost Town. Würth skillfully frames the essence of these women through his lens: capturing their boldly flirtatious and sensual nature along with their strength, intelligence and independence; this delicately balanced play between indulgence and restraint is what brings the pictures to life. Shot over seven days on black-and-white Kodak Tri-X film, the images were scanned for the book from 16 x 20 inch gelatin silver prints and never retouched. The book also features an epilogue by fashion and culture critic Lesley M. M. Blume. In late 2013, Stephan embarked on a whirlwind road trip, winding his way across Burundi, a small landlocked nation in the heart of East Africa. Snapping images on an iPhone during his journey, Würth portrays everyday life in the impoverished country, from the bustling open-air markets of its capital, Bujumbura, to the plantations of sweet banana and coffee deep in the country’s foothills. The photographs highlight the integral role the bicycle—or ikinga—plays in Burundi’s culture. With a candid eye that recalls Walker Evans’ surreptitious subway shots of New York in the 1930s, Würth’s photographs reveal a lively, resourceful, and entrenched bicycle culture that is vital not only to Burundi’s economy, but also to the daily survival of its countrymen. At times playful and intimate, Ikinga is a bold meditation upon the power of creativity and improvisation during times of great difficulty.